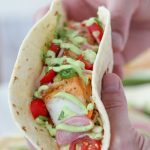 Fish Tacos made with flaky and juicy cod, avocado crema, tomatoes, cabbage mix and the most incredible pickled onions all wrapped in a soft flour tortilla. 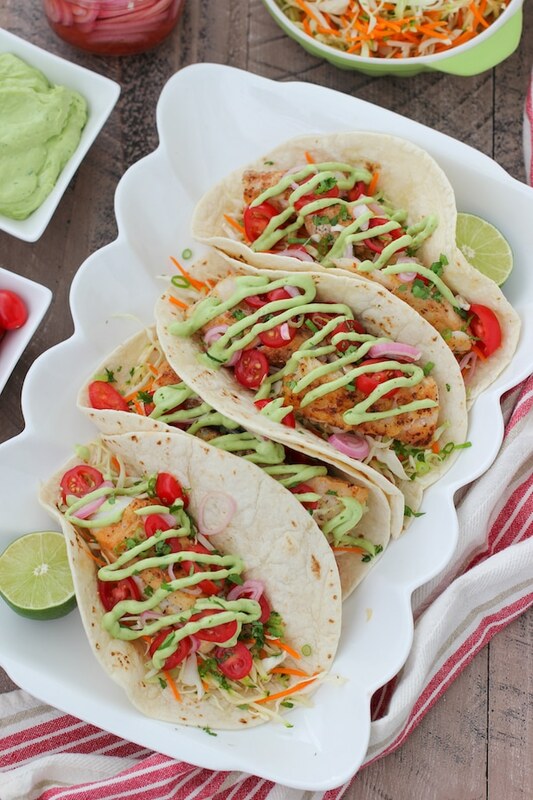 Tacos are perfect any day of the week, but especially during the summer when you don’t want to spend too much time cooking. 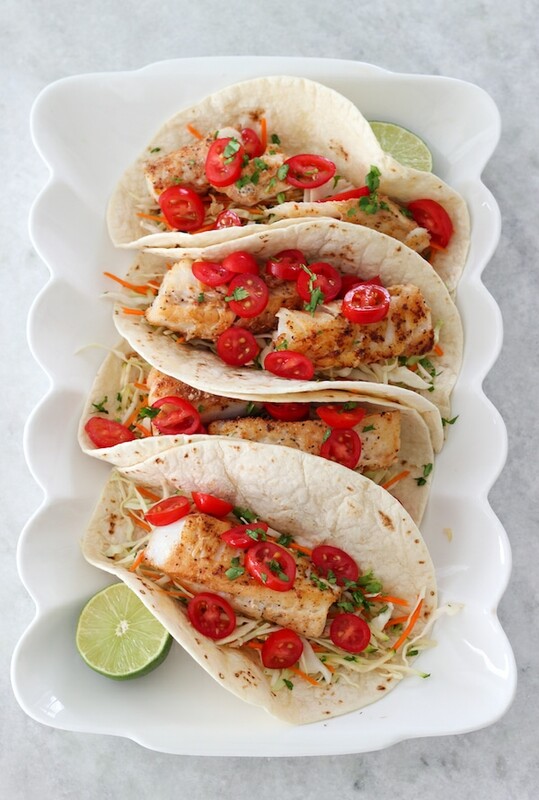 Using fish makes them extra light and the rest of the components keep it just as healthy, but have tons of fresh flavor and plenty of crunch and satisfaction in every bite. 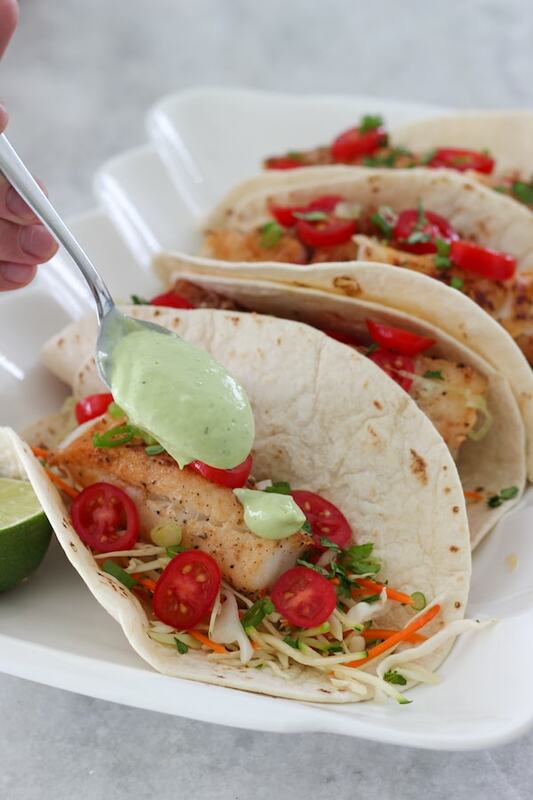 I am using cod in these Fish Tacos, but you can also use many other kinds of fish, as well as shrimp. Today, I am actually sharing not one, but THREE outstanding recipes in one. 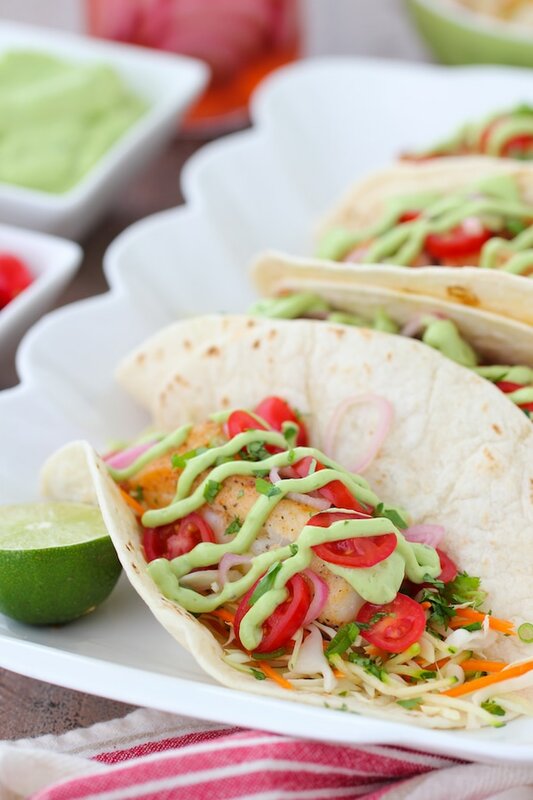 The Fish Tacos are taking center stage, but the sweet Pickled Onions and the creamy Avocado Crema most certainly deserve just as much attention. My husband and I don’t usually like adding raw onions in almost any dish, but we both fell in love with these pickled onions. The pickling liquid takes all the bite out of them and the sweetness makes them extra tasty. 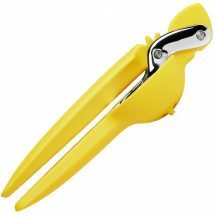 They will be perfect for adding to lots of other things, anything with pulled pork, chicken or beef, as an addition to chicken and tuna salads, on top of avocado toast or bagel and lox. 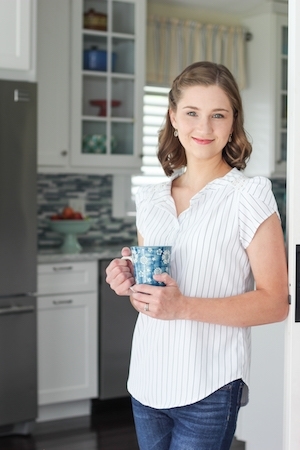 Keep a small jar in your refrigerator and add them to your meals throughout the week. 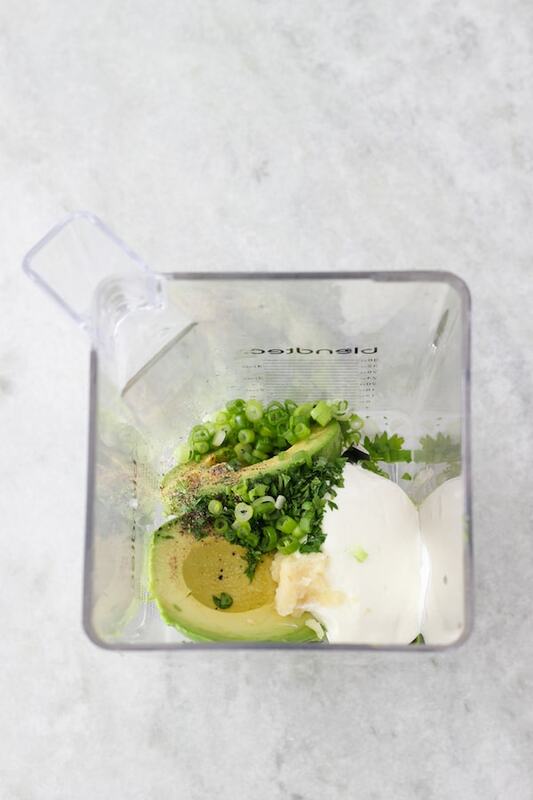 The Avocado Crema will be great on burgers, wraps, sandwiches or even to dress your salads. 1-2 Tablespoons cilantro, parsley, green onion, etc. Slice the shallots or red onion and put them in a jar or bowl. 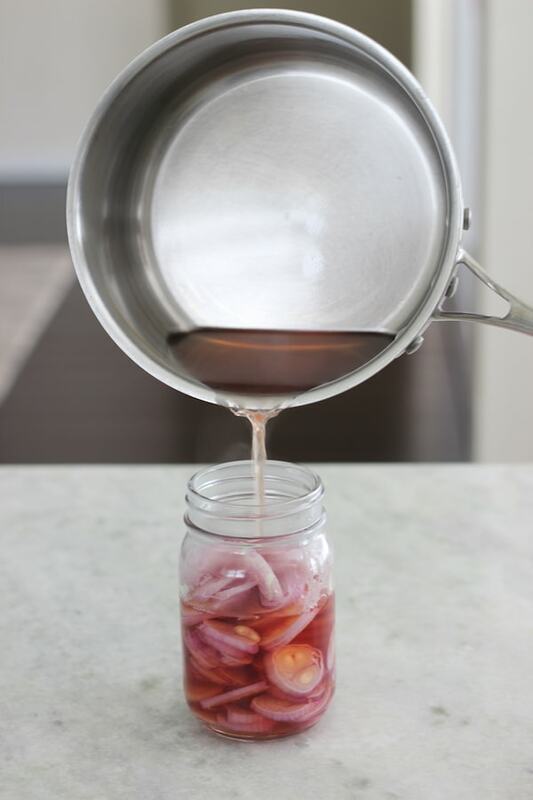 In a small saucepan, combine the water, red wine vinegar, sugar and salt. Cook just until it reaches a simmer and all the sugar is dissolved. Pour the pickling liquid over the shallots/onion. 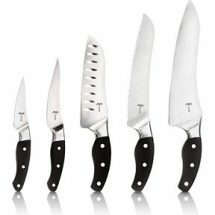 Set aside while you are preparing the rest of the meal. The pickled onions will be good in the refrigerator for several weeks. 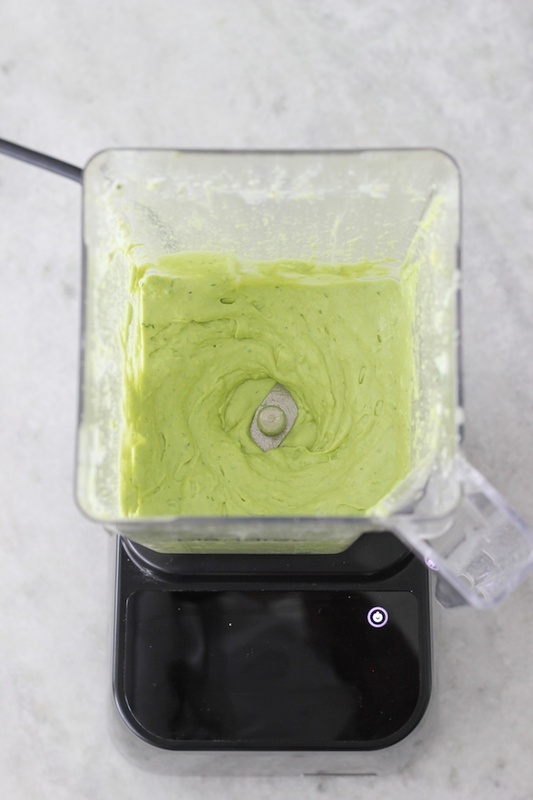 In a blender, combine all the ingredients for the avocado crema until smooth. Season with with salt and ground black pepper, to taste. You an add more or less lime juice, depending on how you like it. 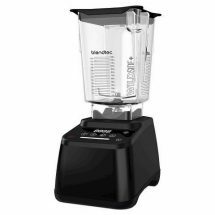 Also, you can add a splash more milk or buttermilk to thin it out more, if you want to. 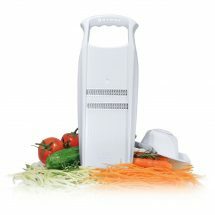 Prep all your toppings – shred the cabbage, grate the carrot and zucchini, chop the tomatoes, cilantro and green onions. Toss the cabbage, carrot, zucchini, and herbs together. Sometimes, instead of using just fresh veggies like here, I will use coleslaw or another type of Cabbage Salad. The Crunchy Cabbage Cucumber and Corn Salad is one of my favorites with Fish Tacos. You can also add rice to the tacos, if you’d like. 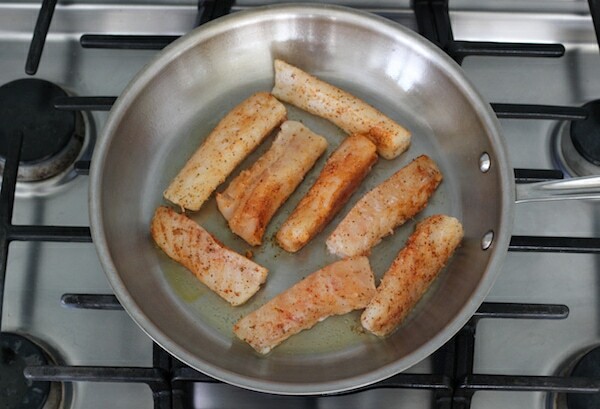 Cut the fish fillets into 1 1/2″ strips. 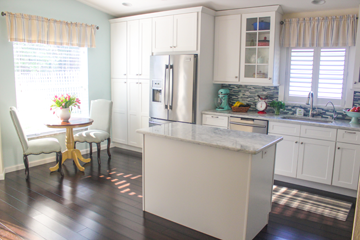 You can use so many different kinds of fish – cod, grouper, tilapia, snapper, trout, salmon, etc. Season the fish with salt, ground black pepper and any seasoning mixes that you like. I use lemon pepper seasoning, chili lime seasoning, paprika, and Old Bay. Heat the oil over high heat in a large skillet. 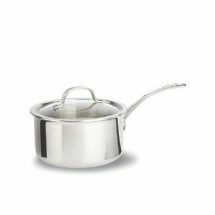 If you don’t have a really good quality stainless steel skillet, fish will really stick to it and it will be a giant mess. Use a nonstick skillet instead. Cook the fish until it’s golden brown and cooked through on both sides, 3-5 minutes per side. Heat the tortillas in a skillet or the microwave to warm. 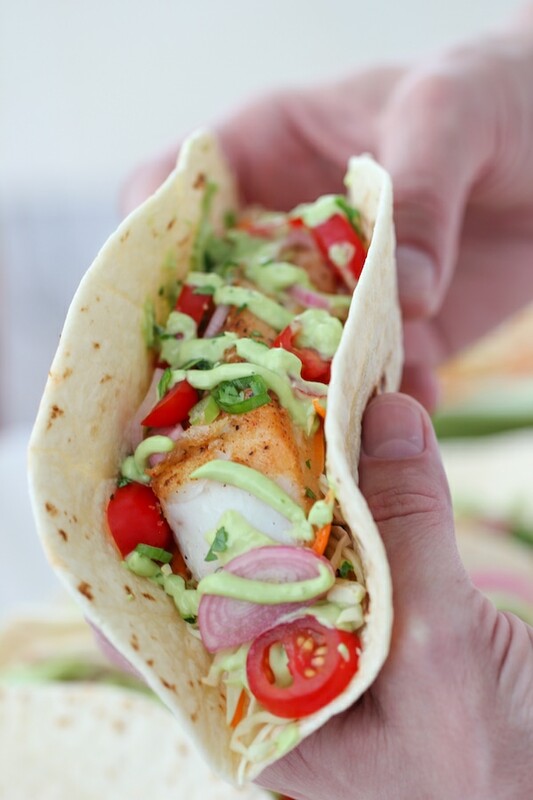 Place the cabbage mixture in the center of the tortillas, top with the fish, pickled onions and tomatoes. Drizzle with the Avocado Crema. 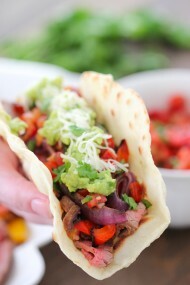 You can place it into a squirt bottle for convenience, use a spoon, or put it in a ziplock bag, snip off a tiny bit from one corner and drizzle it on top of the tacos. When I serve Tacos for guests, I make a bar with all the different components and then everyone can customize their tacos any way they want. 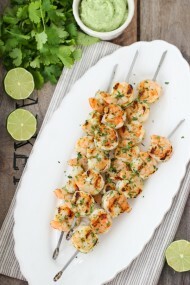 1–2 Tablespoons cilantro, parsley, green onion, etc. 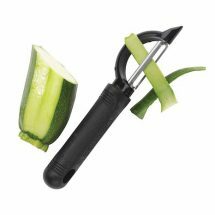 Prep all your toppings – shred the cabbage, grate the carrot and zucchini, chop the tomatoes, cilantro and green onions. 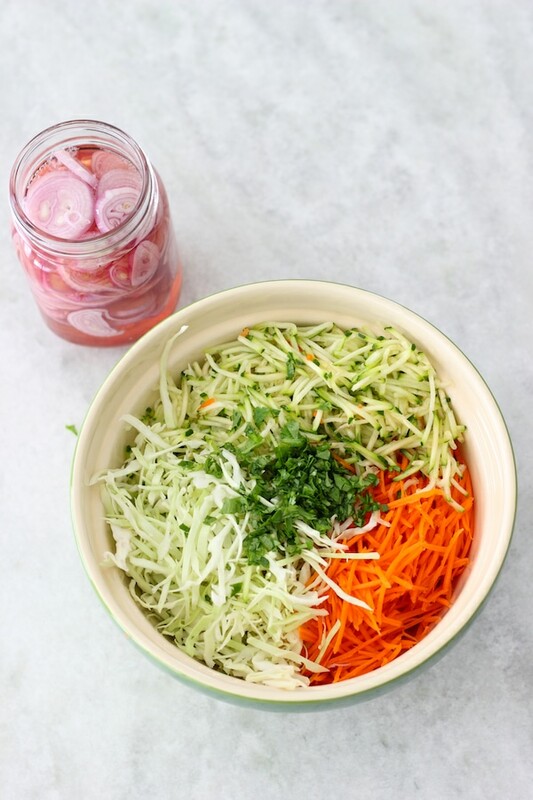 Toss the cabbage, carrot, zucchini, and herbs together. Sometimes, instead of using just fresh veggies like here, I will use coleslaw or another type of Cabbage Salad. 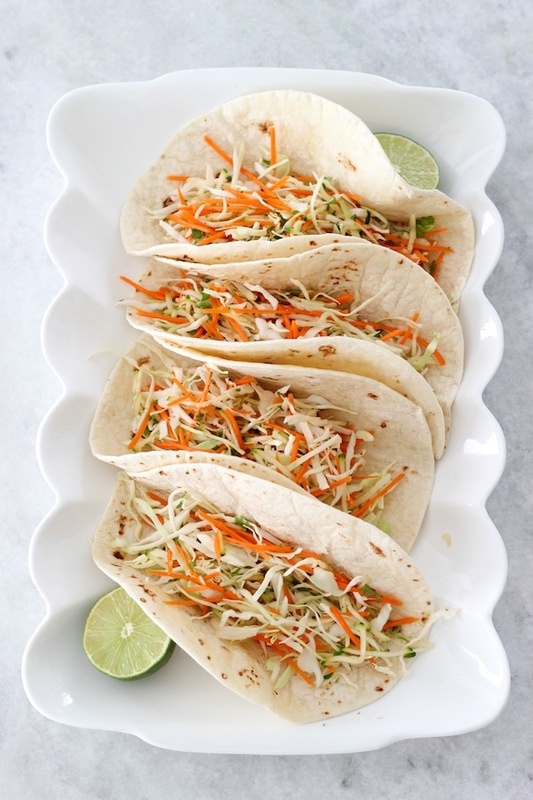 The Crunchy Cabbage Cucumber and Corn Salad is one of my favorites with Fish Tacos. You can also add rice to the tacos, if you’d like. 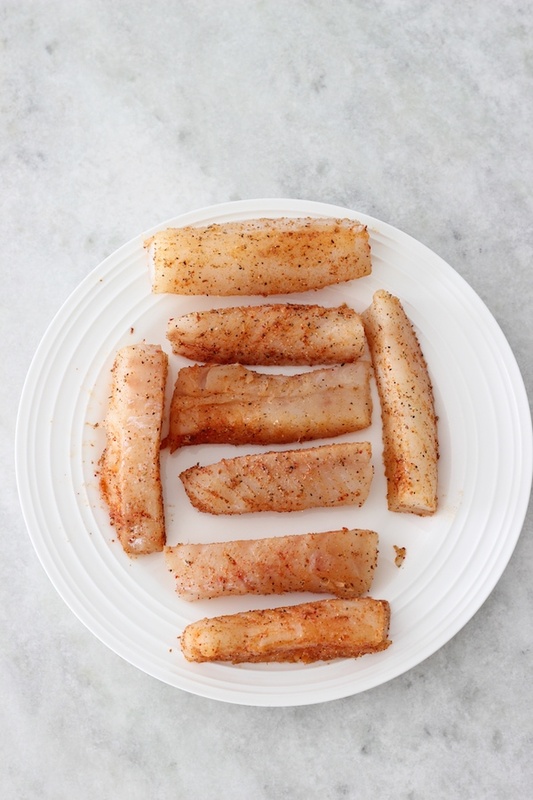 Cut the fish fillets into 1 1/2″ strips. 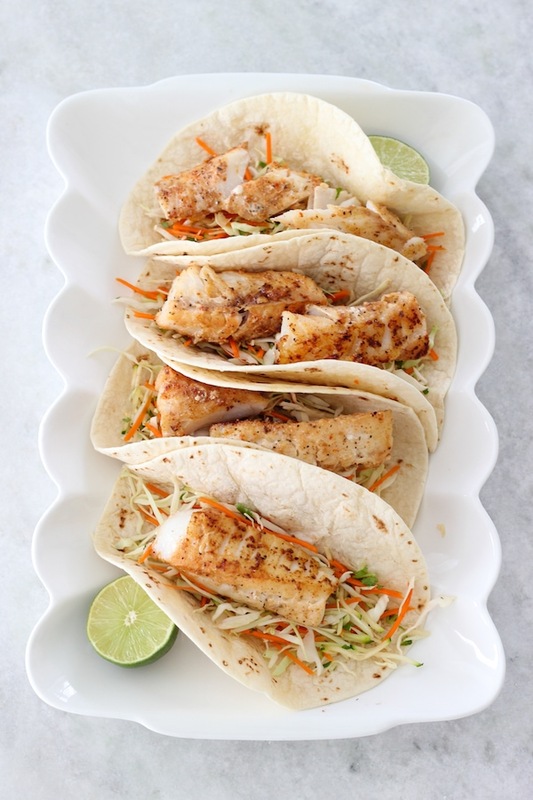 You can use so many different kinds of fish – cod, grouper, tilapia, snapper, trout, salmon, etc. 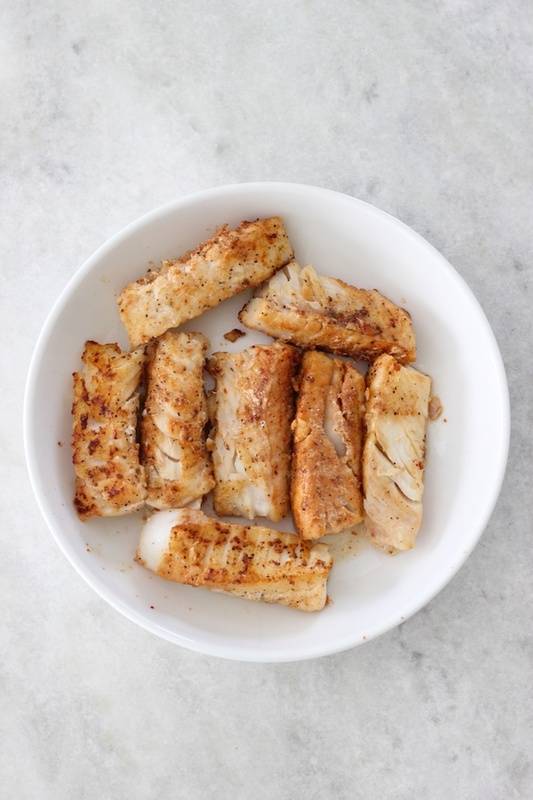 Season the fish with salt, ground black pepper and any seasoning mixes that you like. I use lemon pepper seasoning, chili lime seasoning, paprika, and Old Bay. Heat the oil over high heat in a large skillet. 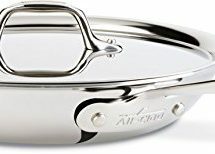 If you don’t have a really good quality stainless steel skillet, fish will really stick to it and it will be a giant mess. Use a nonstick skillet instead. 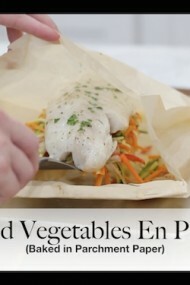 Cook the fish until it’s golden brown and cooked through on both sides, 3-5 minutes per side. Heat the tortillas in a skillet or the microwave to warm. 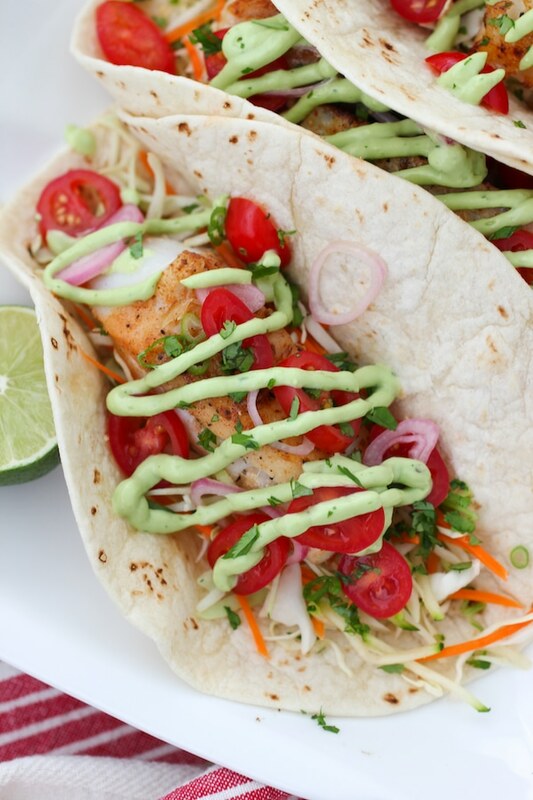 Place the cabbage mixture in the center of the tortillas, top with the fish, pickled onions and tomatoes. Drizzle with the Avocado Crema. 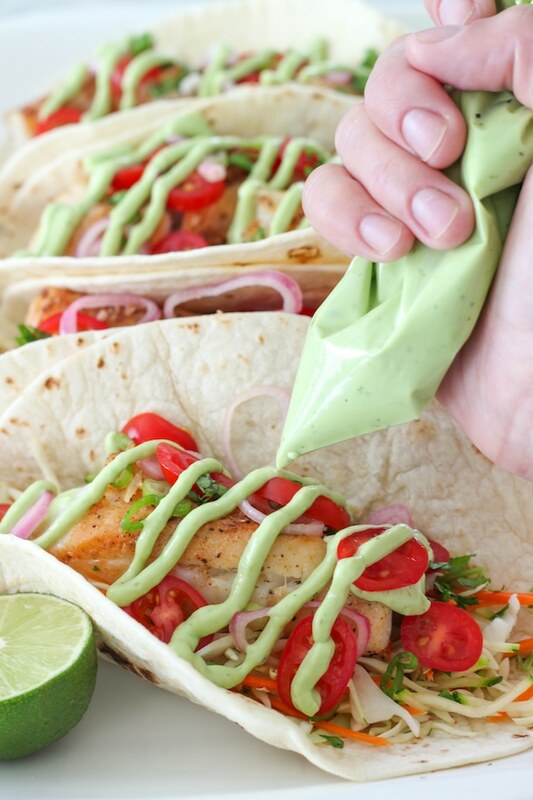 You can place it into a squirt bottle for convenience, use a spoon, or put it in a ziplock bag, snip off a tiny bit from one corner and drizzle it on top of the tacos. When I serve Tacos for guests, I make a bar with all the different components and then everyone can customize their tacos any way they want. This looks amazing… I’ve added it to this weeks’s line-up! 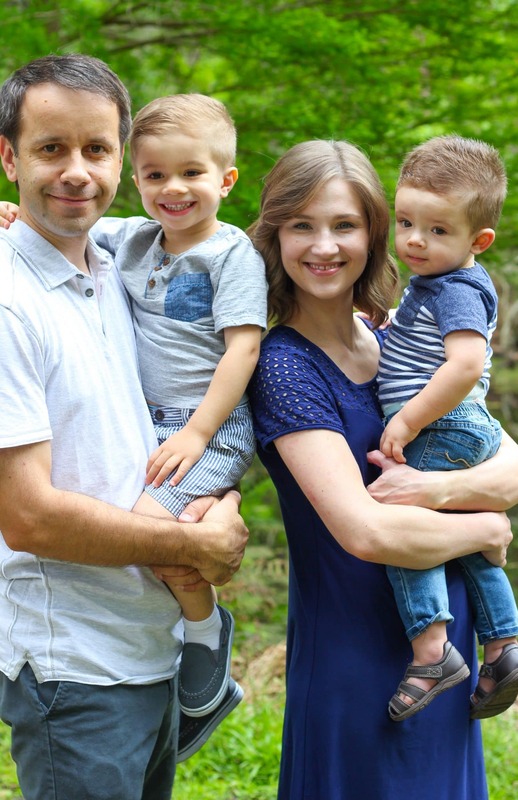 Thank you, Olga!! That’s awesome, Brittany! I hope you loved the tacos. So fun to cook with toddlers:). I’m happy to hear that, Smitha:).